Inter set up a Coppa Italia quarter-final showdown with Lazio by beating second-tier Benevento 6-2 at a nearly empty San Siro on Sunday. The seven-time winners, forced to play the tie behind closed doors after racial abuse was aimed at Kalidou Koulibaly in last month's meeting with Napoli, were two up early on through Mauro Icardi's penalty and Antonio Candreva's measured strike. Luciano Spalletti's side put the game to bed on the stroke of half-time courtesy of Dalbert's powerful finish, with Lautaro Martinez adding the fourth after the interval. Benevento deservedly reduced the deficit when Roberto Insigne steered home a precise free-kick, only for Martinez to net again before Filippo Bandinelli's goal brought the game's tally to seven. And there was time for one more, perhaps the pick of the bunch, as Candreva netted at the end of a fine solo run. If the visitors had plans to keep it tight in the opening exchanges, they were foiled inside three minutes. Luca Antei fouled Candreva in the area and Icardi confidently converted from the spot. Benevento should have been level soon after, but Andres Tello side-footed straight at Daniele Padelli from eight yards out. 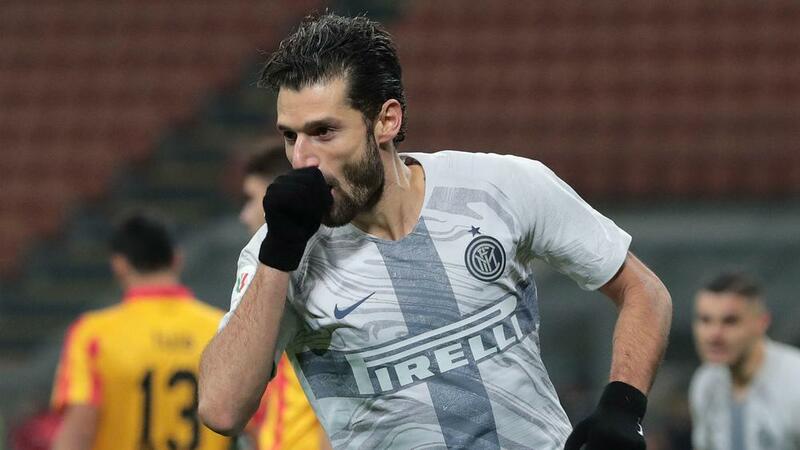 And the underdogs, who lost twice against Inter en route to relegation last season, were made to pay when Candreva drilled home after Icardi's header had bounced back off the post. With Inter boasting an unbeaten home run stretching back to September, a route back into the match seemed unlikely for Benevento, who nonetheless applied themselves willingly as Insigne forced a smart stop from Padelli. But their already dwindling hopes practically vanished when Dalbert raced onto the end of the impressive Ivan Perisic's pass to lash beyond Lorenzo Montipo for his first Inter goal. The rout continued when Martinez nodded in Perisic's cross three minutes after the restart, but Benevento finally got off the mark themselves as Insigne converted a fine set-piece from 20 yards. Another Perisic assist allowed Martinez to double his tally as Montipo was beaten for a fifth time from six shots on target, with Sassuolo loanee Bandinelli's header from Riccardo Improta's cross preceding Candreva's excellent last-gasp goal. Inter take a step closer to what would be an eighth Coppa Italia crown, with the last having come in 2011. But Lazio will provide sterner opposition than a Benevento side who in truth were beaten before they had even got going. Then again, Inter have already won 3-0 at Lazio this season. Inter were always going to have more of the ball but it still requires a creative spark to make things happen and Perisic provided that. He laid on three assists to make sure this was a comfortable evening for the home side. Poor Montipo. He spent more time picking the ball out of the back of his net than he did making saves. That is no exaggeration – he made only two saves in the whole match. Spalletti's side host Sassuolo in another behind-closed-doors match at San Siro on Saturday having won seven consecutive Serie A home games, keeping clean sheets in the last six. Benevento, meanwhile, head to a Lecce side just one point and one place above them in fifth.